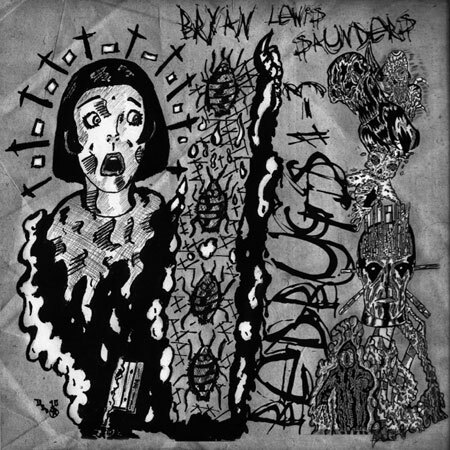 Painter, musician, poet, performer and all around twisted Renaissance man Bryan Lewis Saunders is one talented and prolific individual. In addition to all of the aforementioned endeavors, he also somehow finds time to belch out what he calls “stand up tragedy,” a depressing, morose form of spoken word. Bed Bugs 1-3 is a whole LP’s worth of such haunting stories culled from the author’s tumultuous life down in Johnson City, Tennessee. The album opens with some diary-like entries detailing Bryan’s interactions with an emotionally disturbed girl–all delivered via tinny yet menacing spoken vocals that sound like they’re coming in over a telephone line and rudely splattered with swirling noise drones. You are currently browsing the archives for the Bryan Lewis Saunders category.